The typical anxious cat hides, urinates inappropriately, increases scratching, and/or vocalizes excessively. Some cats are naturally anxious while others can suddenly feel anxiety due to an underlying cause. Anxiety in cats can arise from many different issues. Veterinarians and behavior specialists look at the cat’s physical and emotional health, as well as instinct traits to help figure out what’s going on and find solutions. You can apply the H.I.S.S. test (health, instinct, stress, and symptoms) to discuss and figure out ways to reduce your feline's anxiety. Cats that do not feel good can react with anxious behavior. Kitties have evolved to be “great pretenders” and never let on that they feel bad. Stoic cats with hidden aches show only subtle signs, if at all. A hurt paw may not cause a limp but instead prompts the cat to hide or become clingy, for example. Resolving an underlying health issue often relieves anxious behaviors. For a cat, the unknown equals danger. Wild kitties that failed to honor this truth were taken out of the gene pool, while properly “cautious cats” survived to breed and passed on this “caution gene” to future generations. Being cautious and hiding are survival instincts, so your cat may naturally be a little more anxious than others. Anything has the potential to increase stress and anxiety but the cat's environment ranks at the top of the list. Environmental stressors include crowded conditions, climate, resource availability, and especially living and competing with other cats. To address environmental stressors, try creating a cat considerate environment—that is, lots of feline resources that offer healthy outlets for normal and typical cat behaviors. 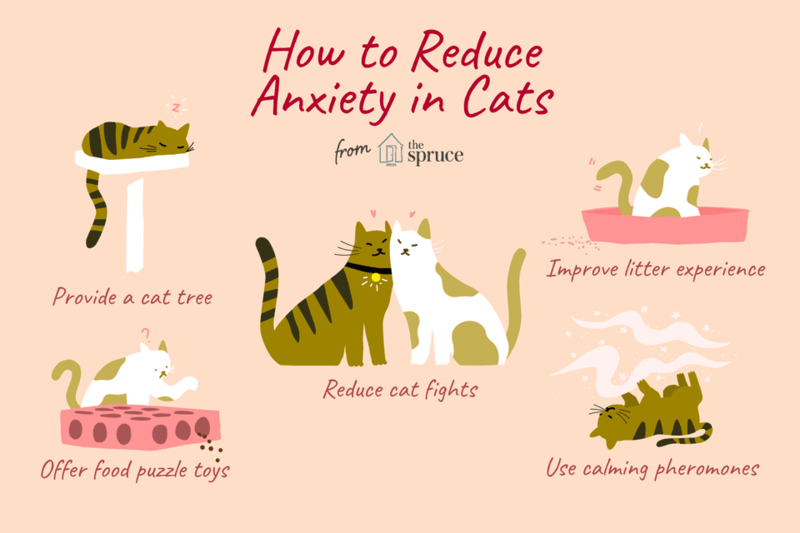 Once you figure out what cats do most of the time, you can make those activities even more agreeable which reduces the potential stress and anxiety. Cats prefer to hide in dark places where they can’t easily be seen. They also like inaccessible places where they can’t be reached and can most easily defend. Confident cats often seek out high resting spots, while anxious ones may resort to ground level hiding. Favorites include under the bed or other low-to-the-ground furniture, basements, under stairs, in closets, or inside boxes or piles of clutter. Since cats spend 62 percent of their time sleeping or resting, you can help an anxious cat by giving them the ideal cat tree. Offer a variety of perching opportunities throughout the house to reduce arguments over ownership in multi-cat households. Cats tend to stretch and scratch upon awakening, so placing scratch objects near resting spots can make kitty more comfortable as well. Cats spend 17 percent of their time either hunting or eating. You can address both by using food puzzle toys or creating a “treasure hunt” with small portions on dishes laid out around the house. Playing and exploration mimics hunting behaviors and can reduce stress and anxiety. Homemade toys motivate cats to explore, and rotating toys increases novelty and interest. Up to 70 percent of owners reported that their cats have occasional fights. If this is the case in your home, try placing a belled collar on the aggressor cat(s). This will give the victim warning so the kitty can avoid encounters. Anxious cats urinate outside of the box either with urine sprayed against vertical surfaces or by squatting to wet flat surfaces. This most commonly has territorial/marking aspects, with the cat using the scent to identify “owned” property, warn off other animals, or self-comfort with the cat’s familiar scent. Common targets for urine include property important to the cat: owner-scented objects such as the bed, near windows or other lookouts (where they see stray cats), or by doors (where they hear or smell stray cats). To prevent a lot of this behavior, provide the best litter boxes possible and situate them throughout the home in a variety of locations instead of clustered in one area. The one-plus-one rule (one box per cat plus one) reduces anxiety because cats don’t have to share. It's also important to keep all litter boxes clean. A dirty box will discourage proper elimination and can cause or enhance any anxious feelings. Another option is to use scent and natural remedies to relieve some of your kitty's anxiety. Feliway is one popular choice that comes in diffuser or spray bottles. It is a synthetic feline facial pheromone that helps ease tension related to territorial and environmental stress. Rescue Remedy, or one of the other more specific Bach Flower Remedies, can be particularly helpful for anxious cats. There is one specifically designed for pets, which can be found in many pet stores. Do be careful about some aromatherapy products, especially if they are not pet-specific. A number of essential oils are potentially toxic to cats. These can cause health problems—some of which are very serious—and that may increase your cat's anxiety. Cats may not immediately adjust to any changes you make, so be patient. If you have eliminated potential health concerns, do your best to make your cat's environment as calm and inviting as possible. If one thing doesn't seem to be working, add another one of the suggestions and see how the cat reacts to the combination. At the same time, remember that change can stress a cat. Try not to make too many changes all at once. Likewise, if your household has experienced a change recently—moving to a new home, a new or loss of a family member, or even rearranging the furniture—do your best to provide your cat with familiar things. A favorite toy or old scratching post can bring a good deal of comfort to your cat. While waiting for your cat to come around, try to maintain a calm, stress-free home as much as possible. You don't need to walk on eggshells for fear of disturbing the cat, however, and they should get used to your "normal" home. With time, many anxious cats settle in and find comfort.